It’s a hefty statement, but it’s hard to argue. 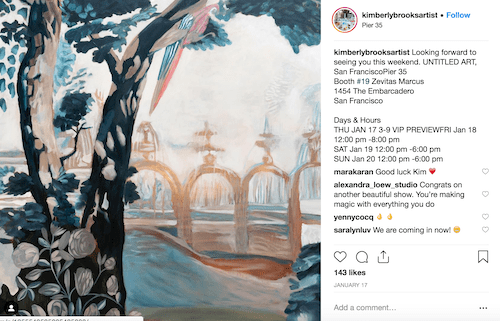 Art aficionados are surfing Instagram profiles from all around the world to find their latest creative favorites, instead of traipsing out to formal galleries that have just a few select pieces of work on display. 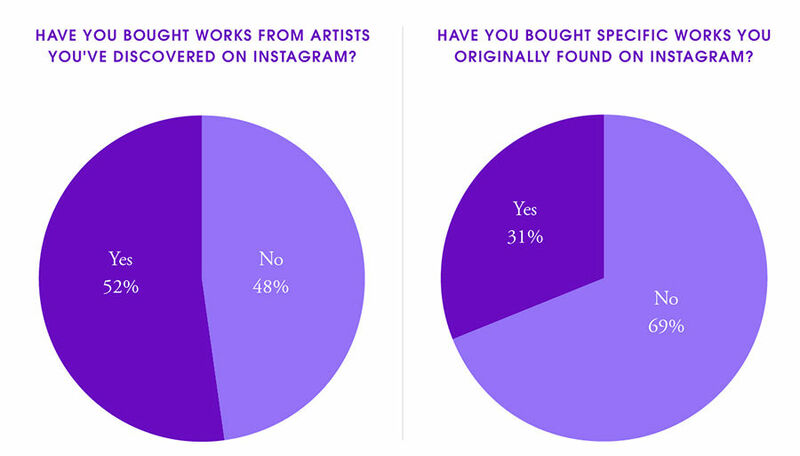 In fact, 52% of art collectors have bought a piece from someone that they first discovered on Instagram. Art + Instagram Just Makes Sense, Right? It’s the biggest visual platform in the world. 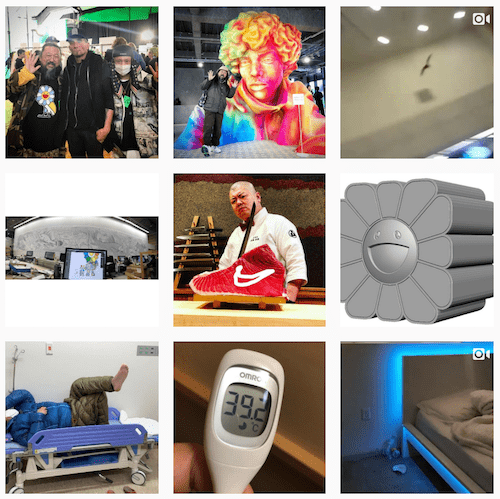 Heck, Instagram feeds are basically laid out like little online exhibitions. 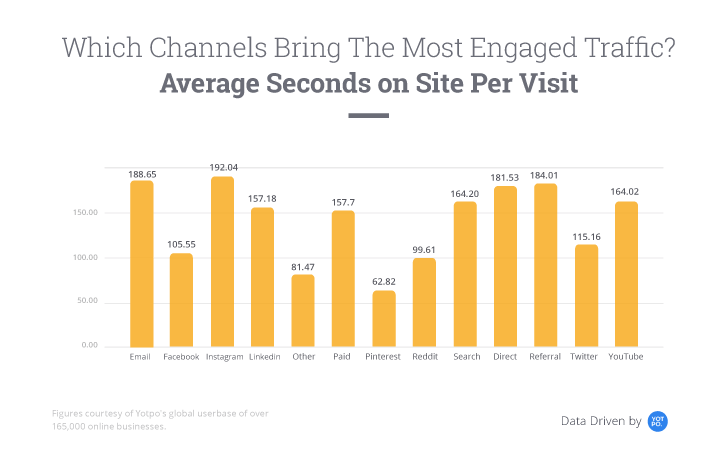 Because it’s such a visual forum, Instagram has attracted a more creative and engaged user base than most other social media channels. This has also given artists a lot more flexibility in how they advertise their own work. Gone are the days of having to fight for the attention of a few art curators. Instead, creatives have a pre-built platform on which to share their artwork and can build their own audience to sell to. 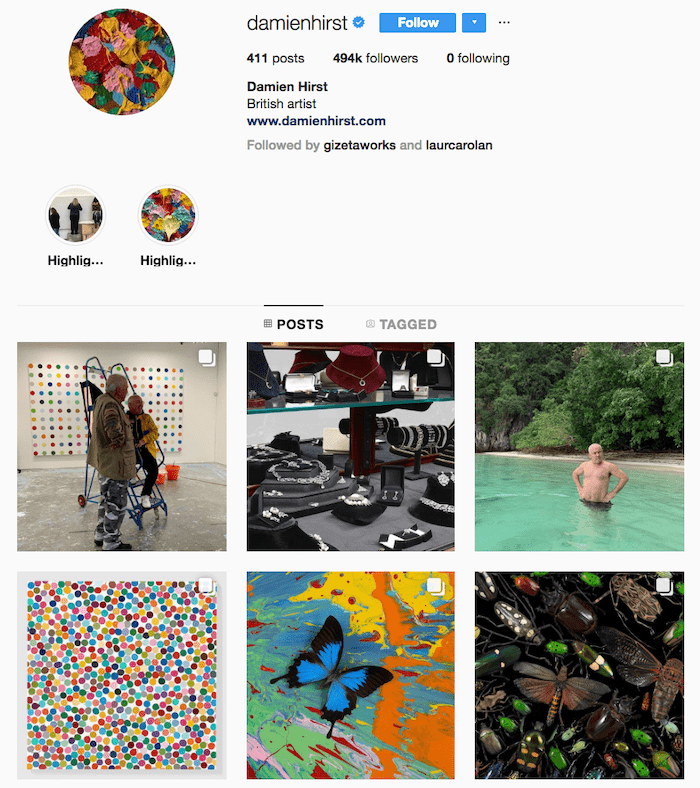 And while this is obviously working great for the likes of Damien Hirst, Jeff Koons, and Ai Weiwei, who have between 300,000 and 500,000 followers each, is it the same for artists who aren’t as well-known? The simple answer is yes, and it can work for you. 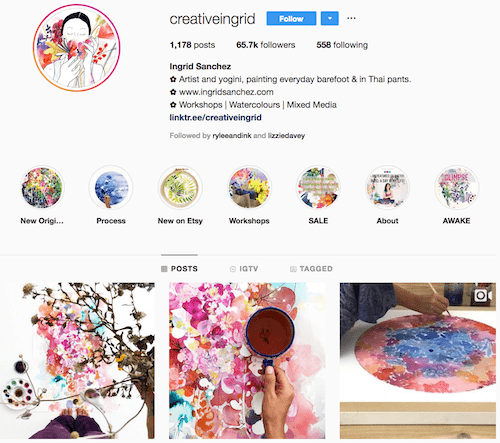 If you’ve started wondering how, exactly, to leverage the awesomeness of Instagram to share and sell your own artwork, keep reading. We’re here to get you on the right track with this handy little guide. Instagram gives artists more autonomy over their advertising process than ever and, perhaps more importantly, their sales. It’s a great showroom and personal no-commission gallery. But instead of just posting pics of your finished pieces, use this platform to share stories from behind the scenes — that is what people don’t get from visiting a gallery or just looking at your work on your website. It’s an inherently social platform; think of Instagram as a place to start conversations, and think about what you can tell your followers about your work that they wouldn’t already know by just looking at it. The proof is in the pudding, after all, and a picture speaks a thousand words. Don’t fix it if it ain’t broken, etc. But… with so many artists out there leveraging the power of Instagram, if you want to stand out and truly engage your followers, you have to go deeper than just sharing pictures of your work (no matter how pretty they are). 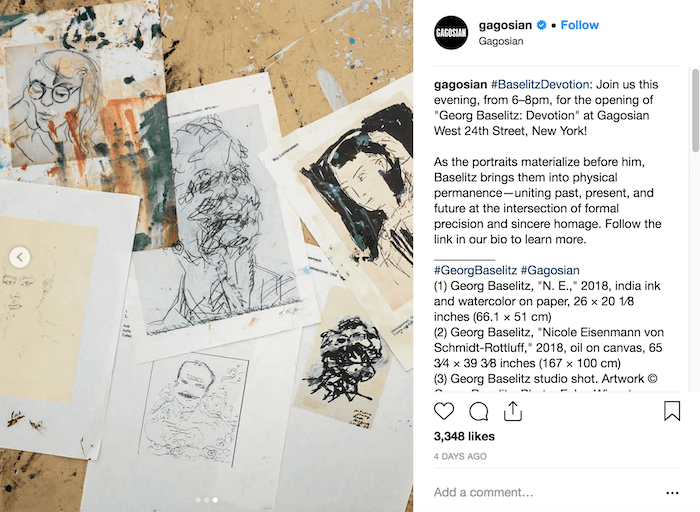 Gagosian shares artists’ work from all over the world on their Instagram channel. But instead of just sharing images of the artwork, they share the stories behind the work in the captions, letting us have an insight that the photo itself wouldn’t. The idea of giving away your art for free might leave a sour taste in your mouth, but hear us out on this. Giveaways can be a great way to find new followers who love your art. Bear in mind here that we’re not telling you to give away the masterpiece you’ve been working on for the past five months. Rather, it’s a great way to leverage a couple of small prints, for example, to boost your online profile. 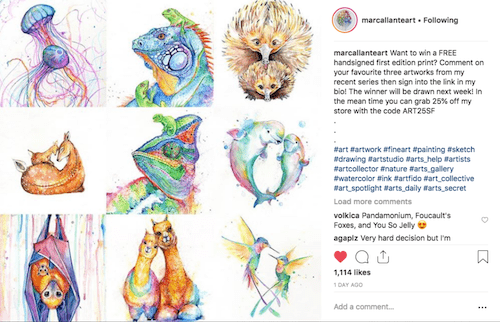 Take a leaf out of Marc Allante’s book and do a giveaway to generate engagement around a batch of new products and get your artwork in front of more people. By now, you’re using Instagram as your mobile gallery, right? It makes sense that you’d only want to show off high-quality stuff that you’re proud of, but are you making a mistake by limiting yourself that much? We’re not saying don’t put your best stuff out there — by all means, get a professional photographer in and go crazy. But Instagram presents an opportunity to try something different, too. If you look at celebrities’ social media today, you’re going to see down-and-dirty footage of them eating Subway for lunch or schlepping around in their trackies. They’re being human, so why can’t you do the same as an artist? Allow your audience to know a little more about your world, including its less-glamorous moments. Maybe avoid airing your midnight meltdowns, but feel free to share your processes, including those learned-the-hard-way moments. Videos do great on Instagram because viewers like to see the “reality” behind a polished finished product. You can use them to show your processes, like Megan Sayers (a.k.a. meg_ladoodle) does. Post videos in either your feed or via Stories, or simply share pictures of the progress of a particular piece. Publicly airing how you make your art builds interest and trust around your work, plus there’s a uniqueness or “new-ness” factor that makes people feel involved and interested. Think about it: In an art gallery or book, you almost always only get to see the final work, and historically, that’s all you could ever see — until now. Social media has allowed artists to go behind-the-scenes and share their thought processes and the techniques they use to get to the final piece, and everyone benefits. It’s almost like… the journey is more enjoyable than the destination! Everyone loves to look at a pretty picture, but sharing just your artwork simply doesn’t let people into your life. And, when you come down to it, that’s exactly what social media users want. It’s why millions of people avidly watch celebrities’ Stories about inane things they’ve done; we curiously crave a tiny little insight into who these people are. It works the same way for you, too. People want to know who made that work of craftsmanship that they can’t stop looking at! Go check out artist Takashi Murakami’s Instagram: @Takashipom. With one million followers, you know he’s got something good going on there. But, if you scroll through his feed, you’ll actually see very little of his art. Instead, he regularly posts pictures of events and gallery openings he attends, plus everyday life events (he even shared a photo of himself in the hospital). 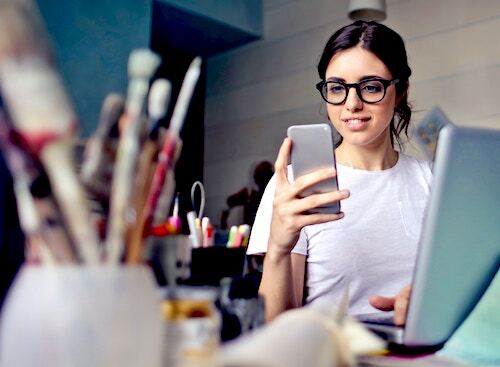 This approach creates a relatable connection with followers that helps bolster popularity and gives artists the chance to interact directly with their followers (something that is incredibly important in social media culture today). It’s difficult to turn Instagram into a money-making machine as an artist without having particularly good connections or attention-grabbing techniques already, — even more so if you specialize in creating top-end pieces that come with a price tag higher than a few hundred bucks. 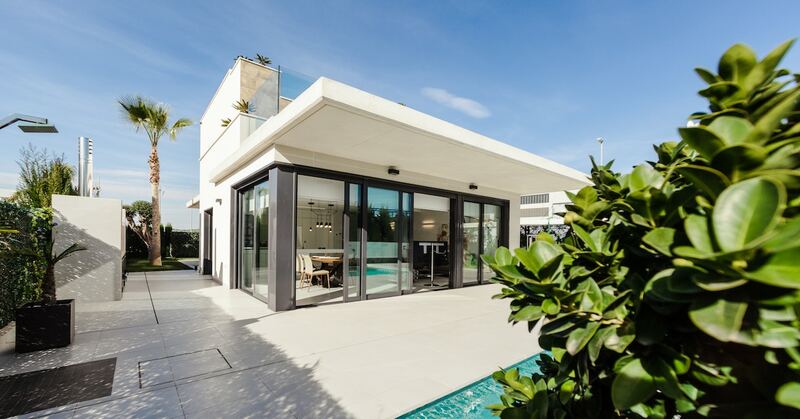 But that doesn’t mean you can’t use Instagram to guide interested parties towards the sale. Instead of linking directly to your shop and promoting that at every opportunity, try inviting your followers to come to a gallery opening or event where your art will be displayed, directing them to your mailing list where they can be the first to hear about what you’re up to, or showing them a long-form YouTube video you made about your work. Artist Kimberly Brooks points people in the direction of one of her shows. This is important. 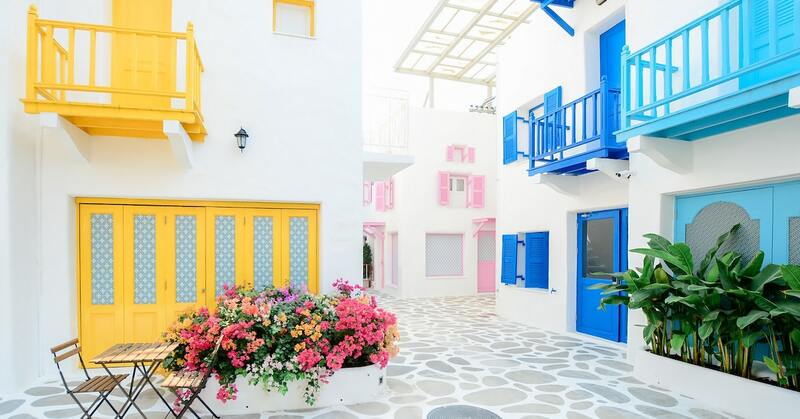 Research shows it takes around seven touchpoints for a fresh face to buy from you, meaning you need to pop up on their radar seven times before they’ll think about going anywhere near that “buy” button. That’s not to say you can’t sell your art on Instagram. If your pieces do err on the pricey side, what about also selling quick doodles and sketches for $20 to warm your fans up? Expecting someone who’s only just “met” you to buy something over $50 is asking a lot, so start by offering something smaller (this is known as a tripwire in the biz). Quick Tip: Have over 10,000 followers? Use the Instagram Stories’ “swipe up” feature to direct followers to specific landing pages where they can buy, sign up or check out an event. 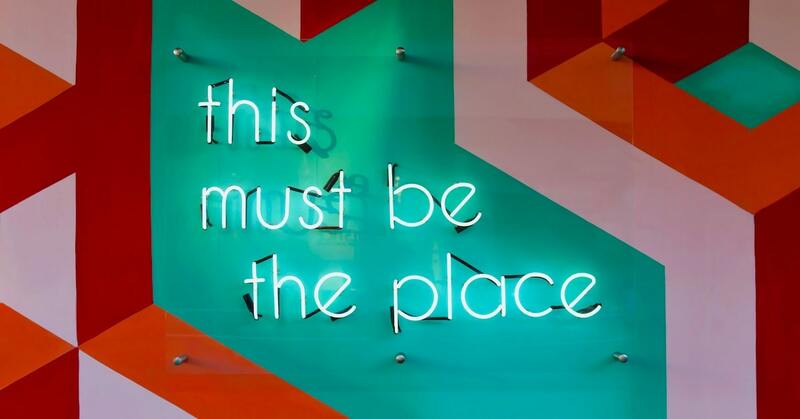 Everyone suffers from FOMO (the Fear of Missing Out) every now and again, and you can use this to your advantage with the power of social proof. 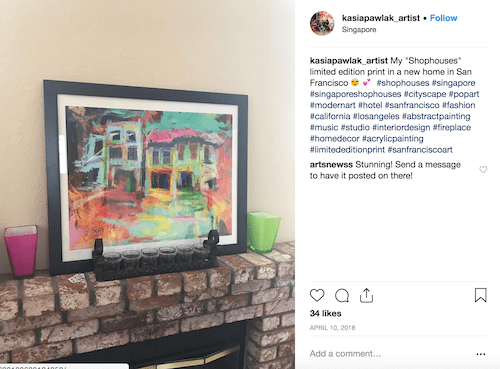 Take artist Kasia Pawlak, for example, who shares pictures that her buyers have sent her of her artwork in its new home. According to research carried out by Nielsen, 92% of people trust recommendations from a peer, while 70% will trust a recommendation from someone they don’t even know. Just a random. internet. stranger. This is actually great news for you, especially because people love to take pictures of art anyway. Ask your buyers to send you a picture of their new piece of art in-situ, which you can then pass on to your followers. We’re always advocating for making the most of the features Instagram provides, but many artists still overlook the power of Story Highlights. The little circles that show up below a profile header can be very effective to categorize different parts of your business and life. For example, Ingrid Sanchez uses her highlights to categorize her processes, new work, sales, workshops and information about her as an artist, so new followers can quickly find what they want to know. 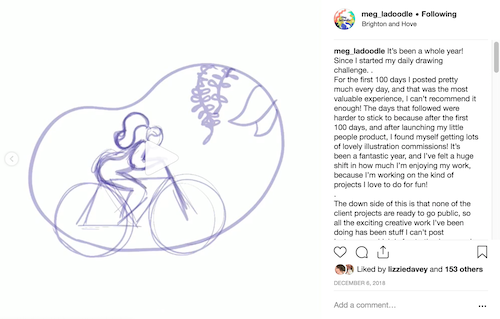 This is a great way to create a more rounded, wholesome online persona, including personal Stories on your Instagram account with separate Stories to do with your art and processes. We’ve saved the best (and most important!) part for last. Instagram was made for community-building, and the art community is one of the most active and supportive ones online — why wouldn’t you want to be a part of it?! If your work is in a gallery somewhere, you’d better be liking and commenting on all the photos the gallery is sharing like your life depends on it. Because the gallery’s or other artists’ followers might then click through to your Instagram profile, learn more about you, and become your followers and supporters, too. Browse through relevant hashtags, as well. Not only will you find other creatives to build relationships with, you’ll also get to see inspiring works you otherwise wouldn’t have come across. Remember: the more you support other artists, the more support you’ll feel from the community. And, even better, you get to create awesome connections with other creative and productive art fans all over the world! You may discover that the satisfaction of finding a new online arty friend is way better than making a one-off sale. So hit up the comments and engage with people — compliment their work, ask questions, showcase other people’s work you love — and they’ll reciprocate. If there’s one thing we’re certain about, it’s that the art world is much smaller than you think — and that can be a great thing. You’re An Artist, Get Creative! The key to standing out on Instagram is not to do what everyone else is doing on Instagram. You might have expected a set formula you need to stick to in order to see results, but you’re a creative and your Instagram feed should reflect that. Share your processes, build relationships with other artists, and don’t be afraid to show stuff that isn’t your best. Rather than making it about the sell, you should be thinking of Instagram as a platform for nurturing a community and building your online profile. When you start doing that, the sales will come naturally. What are some similar creative aspects you see when it comes to social media marketing and creating your work of art?